During postmenopause, a lot of women will have the worst of menopause symptoms behind them, but that does not mean there are not a number of psychological and physiological symptoms that accompany the postmenopausal period, two of which are depression and anxiety. Although they may be discouraging, try your best to understand your symptoms. Keep reading for further information about depression and anxiety during postmenopause and how to deal with them. Depression is a clinical condition that means the sufferer has a chronic feeling of sadness, and this does not disappear naturally with time. It can be accompanied by a range of symptoms that include lack of motivation, irritability, and unexplained aches and pains. The symptoms often arise from the long-term activation of the stress response, characterized by a surge of adrenaline, muscle tension, and a suppressed immune system response. Depression can affect anybody at any stage of life, but during postmenopause, women are particularly susceptible. Symptoms include fatigue, feelings of worthlessness, and concentration problems, which can lead to problems in the workplace, at home, and with family. It is thought that depression occurs during postmenopause because there is no longer enough estrogen to adequately regulate mood, many women report a fear or getting older, and there is often a feeling of femininity being lost now that the women knows she is no longer fertile. Anxiety is similar to depression in that it is a mental condition characterized by low mood and shares many of the same symptoms, but it is recognized as a distinct psychological illness. The basic medical definition is a feeling of unease, and this feeling can accompany the sufferer everywhere, leaving her feeling constantly fearful and worried about the outcomes of real or imagined situations. In short doses it is helpful, keeping the mind more focused, but in the long-term, it can be harmful to health. Women during postmenopause are at risk of developing anxiety for similar reasons that they might experience depression. The fear a woman might have about the aging process can often spill over and grow into fears about other things, such as unfounded worries about the death of a healthy relative or a sudden anxiety about being in social situation. Physical symptoms include a dry mouth, sweating, and shaking. Dealing with depression and anxiety often means a few tweaks to lifestyle habits. A few possibilities are mentioned below. Make sure your diet include plenty of fruit and vegetables, which will give you important vitamins and minerals to lift mood. Drink less caffeine. This chemical will only serve to disrupt sleep and cause anxious thoughts. About 2.5 hours of exercise a week, whether cardio or yoga, can increase happy and relaxing neurotransmitters, such as serotonin and gamma-aminobutyric acid (GABA). Try incorporating meditation into your life. It can help you cope and uncover deeper aspects of your personality, beyond your worries. Around 20 minutes per day with closed eyes, ambient music, and deep breathing is a great start. You can take phytoestrogenic herbal remedies in tea or supplemental form. Research has found that such herbs can help restore lost estrogen in the body, thereby increasing relaxing endorphin levels. Also, hormone-regulating supplements can help with anxiety and depression. Postmenopause can come with its own problems, and many women battling with depression and anxiety might not make the connection. Stay balanced, positive, and enhance your perspective of life, leaving depression behind. 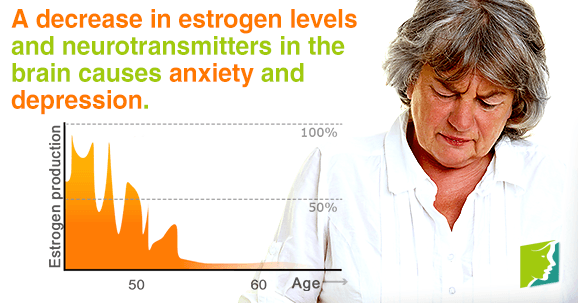 For further information on how to handle anxiety during menopause,click here.